An Academy Award winner for Best Visual Effects, BEDKNOBS AND BROOMSTICKS is a magical blend of live action and animation that makes it one of Disney's most enduring classics. This version of the film is now yours to enjoy in digital splendor remastered and fully restored! 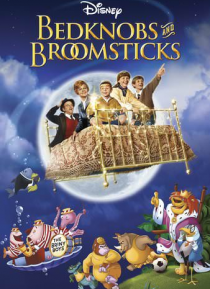 BEDKNOBS AND BROOMSTICKS is the enchanting story of an amateur witch who, along with three precocious orphans, flies into one … fantastic adventure after another aboard a bewitched bed. The legendary Angela Lansbury is charming as the witch, and the inimitable David Tomlinson (MARY POPPINS) delights as the amusing professor whose help Lansbury and the children enlist in order to find an ancient incantation that will save the country from hostile invaders! This special edition of BEDKNOBS AND BROOMSTICKS is sure to be a film the entire family will want to watch again and again!